This Tsavorite sterling ring pictured is a 1/2 carat stone, 5 mm diameter, and available in either sterling silver or 14k gold. 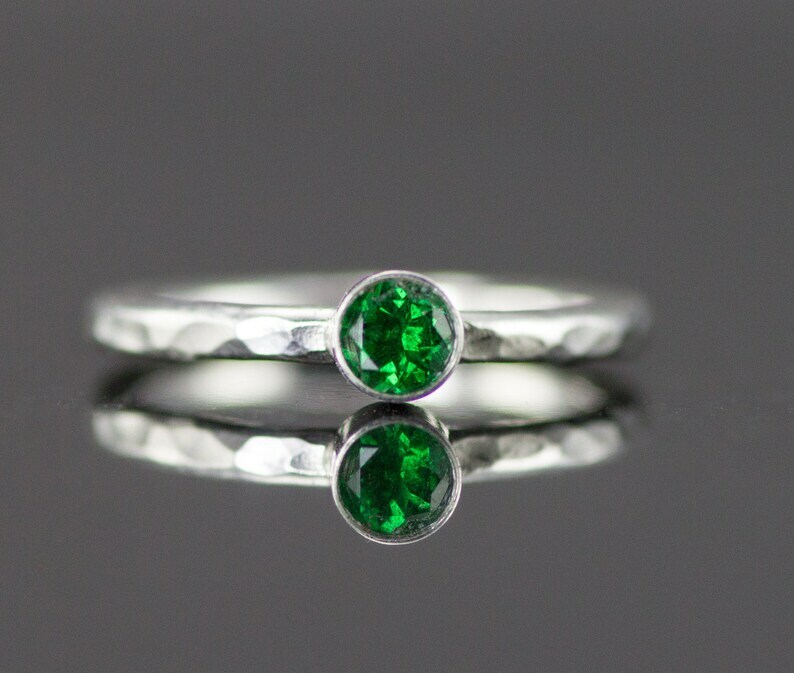 A rare, valuable stone, this green garnet stack ring will become a family heirloom. One of the most beautiful intense green gemstones you will ever have the pleasure of owning, the deep emerald green color rivals the best emeralds. This stackable ring is pictured in solid sterling but is available in 14k gold in either a smooth round or hammered band. Yes, this is a really expensive stone but it is really beautiful and less than half the price of a genuine emerald of the same quality. Completely eye and loupe clean and a brilliant emerald green color! Garnet is the birthstone for January and this would make any woman's heart flutter! I now have 4 mm back in stock, they are just a slightly deeper green and a splendid color. These are fine quality genuine untreated gemstones and I am thrilled to be able to offer these. 14k gold band: 1.6 mm round 100% recycled material, yellow, white or rose gold ***please be sure to note gold color in notes to seller at checkout. *** 18k gold is available as a custom request. To customize your ring - Please write your band selection letter A-G, preference of band finish - shiny, oxidized or matte and for band A add smooth or hammered in the personalization box or in notes to seller at checkout if using a mobile device. I will contact you for any information not provided. Setting: Standard setting is a sterling bezel setting soldered on top of the band for stacking. Low profile is available with the band soldered on the sides of the setting to sit directly on the finger. Changes in setting are available- gold on sterling/ white gold on yellow- just ask for a custom listing. Low profile is not available for bands B - F.
These rings are sturdy enough to be worn alone, but are great additions to a stacking ring set. Please note: I describe and photograph my jewelry in the best possible lighting, but because of differences in computer monitors colors may appear different. Not all rings shown have the stone set, some have just been placed in the setting to get a photo for color or size reference. Each stacking ring is made just for you so please allow 3-5 days (other than special requests) for me to make and send your ring. Special requests may take a little longer. Your ring will be sent in a ring box suitable for gift giving. For storage and care of your fine silver jewelry, I include a drawstring bag and a small square of a Sunshine polishing cloth to renew the sparkle to your silver. Fantastic little ring - stone is exquisite.